Snozone Milton Keynes and Castleford are outstanding venues to learn to snowboard in. We have the best quality snow, excellent equipment and expert coaches who will teach you in a safe, welcoming environment. You can choose to learn in a group or privately at a pace that completely suits you. We have a number of different lesson options to choose from below (juniors are from 7-15yrs). The hire of your snowboard, helmet and boots are all included in the ticket price. Book here for if you want to make multiple bookings when visiting with your friends and family. We deliver children’s snowboard lessons through our industry leading SnoAcademy. We believe snow sports should be available for everyone, so for those with additional needs we also offer adaptive lessons on a private one-to-one basis delivered by Snozone Disability Snow sports. Prices start from £51.99pp. A full day course (7.5 hours including refreshment breaks) for snowboarders who have completed levels 1-5 and now want to improve their snowboarding technique. Guests must be able to control their speed and direction through turns and be able to confidently descend the main slope. This course will include progression to an earlier edge change before the fall line. Working on skills for chairlifts and poma tips – straight running and one foot skills and techniques, along with progression to switch riding and an introduction to flatland freestyle and progression towards learning to jump. A full day course (7.5 hours including refreshment breaks) for those who want to take their first steps into freestyle. This is for snowboarders who can confidently descend the main slope indoors, or on blue runs outdoors. You must be able to control your speed and direction through turns and show good balance and posture. You will be introduced to boxes and kickers and learn 180 grabs as well as confidently mastering flat land freestyle. Taking lesson 1 and 2 from our development structure, this allows you to be involved in the learning process for a longer and more concentrated period of time, rather than a single hour lesson. Your confidence will increase as will your longer term progression and importantly your enjoyment of snowsports! You should then book your next combined lessons at the end of your tuition to ensure your progression continues, consistently. Our expert team will endeavour to deliver all the skills listed for each lesson stage, however skills attained may be dependent on your personal rate of progression or that of others in your group and it is very important that we don’t over-accelerate your learning before you’re ready to move to the next level. If you’re not ready to move from stage 1 to stage 2 on the day and need to rebook a lesson for some additional coaching, we offer a 15% discount for bookings made on the same day as your original lesson. Our guests recommend this combined lesson as the best way to learn how to snowboard. Taking lessons 2 & 3 from our development structure, you’ll learn how to change direction on steeper terrain and will be turning with great confidence and “side slipping” by the end of the session. You should book our next lesson straight away to continue your learning. Our expert team will endeavour to deliver all the skills listed for each lesson stage, however skills attained may be dependent on your personal rate of progression or that of others in your group and it is very important that we don’t over-accelerate your learning before you’re ready to move to the next level. If you’re not ready to move from level 2 to level 3 on the day and need to rebook a lesson for some additional coaching, we offer a 15% discount for bookings made on the same day as your original lesson. Our guests recommend the combined lesson as the best route to take to continue learning your new snow sport. If you are progressing from beginner lessons or you’re returning after a break and need to brush up your skills, these lessons are also ideal for you. Taking in lessons 3 & 4 from our development structure, you will learn how to make turns from your heel and toe edge and then link your turns together on higher terrain with foot steering . You’ll also learn how to use the poma lift. Our guests recommend the combined lesson as the most rewarding- as you’ll be snowboarding with good rhythm and coordination by the end of the session. Our expert team will endeavour to deliver all the skills listed for each lesson stage, however skills attained may be dependent on your personal rate of progression or that of others in your group and it is very important that we don’t over-accelerate your learning before you’re ready to move to the next level. If you’re not ready to move to level 4 from level 3 on the day and need to rebook a lesson for some additional coaching, we offer a 15% discount for bookings made on the same day as your original lesson. If you are progressing from beginner lessons or you’re returning after a break and need to brush up your skills, these lessons are ideal for you. Taking in lessons 4 & 5 from our learning and development structure, you will further develop your turning skills using your toe and heel edge with greater coordination and rhythm, snowboarding down the main slope. Our guests recommend this combined lesson as the best way to conclude the basic learning path and gaining access to the main slopes as you’ll be snowboarding with great proficiency! Taking in lessons 5 & 6 from our development structure this is a perfect lesson to further develop your snowboarding technique and by the end of level 6 you should be making more fluid consistent turns on steeper terrain. Limited Availability Price – £99 for Family private lessons. Available until the end of April, minimum one adult and maximum 2 adults – up to 4 attendees per lesson. Please call us 0333 0030 520. Private lessons are our most popular way to learn with a coach dedicated just for you or your group. Our expert coaches will tailor the tuition to your needs – learn as an individual, in a group or with your family. We recommend however that children learn through the SnoAcademy, our industry leading term time club for children aged 7-15. It’s a great way for your child to perfect their skills and gain confidence in a group environment – and make some new friends too! Adult (90 minute lesson, which includes a full hour of tuition on our real snow slope, with a 15 minute briefing before and a 15 minute debriefing afterwards) or junior 11- 15 years (60 minutes) in our lesson 2 you’ll learn how to slide down the hill in a controlled manner from a steeper gradient. You’ll then learn how to side slip on your toe and heel edge, whilst improving your posture and balance. When you are ready we recommend taking our lesson 3 almost immediately where you will learn how to confidently develop turning skills. 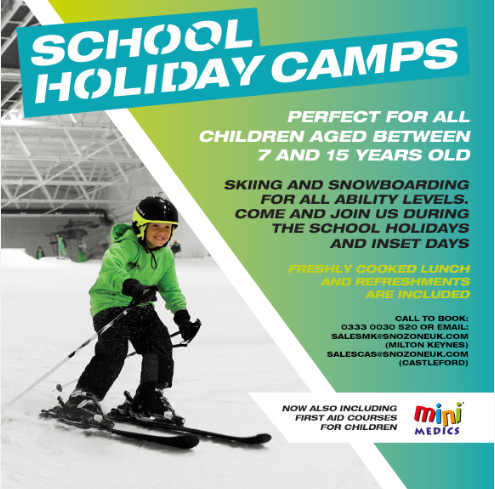 This 90 minute lesson which includes a full hour of tuition on our real snow slope, with a 15 minute briefing before and a 15 minute debriefing afterwards (60 minutes for juniors 11- 15 years) is ideal for someone who has completed lesson 2 or who is keen to return to snowboarding after a break from the sport. You will learn foot steering and improve your turnings on your heel edge and toe edge. During the 90 minutes (for adults, which includes a full hour of tuition on our real snow slope, with a 15 minute briefing before and a 15 minute debriefing afterwards) or 60 minute (for juniors 11- 15 years) of lesson 4 you will learn how to link your turns more consistently and rhythmically on shallower terrain. This 90 minute lesson (for adults which includes a full hour of tuition on our real snow slope, with a 15 minute briefing before and a 15 minute debriefing afterwards) or 60 minutes (for juniors 11-15 years) will teach you how to consistently and rhythmically link turns on shallower terrain and start to make adjustments for steeper terrain. This 90 minute lesson for adults (which includes a full hour of tuition on our real snow slope, with a 15 minute briefing before and a 15 minute debriefing afterwards) or 60 minutes (for juniors 11-15 years) is a development lesson focussed on further enhancing control of your snowboard to make more fluid, consistent turns on steeper terrain. Try the Snozone Orbit at Castleford, a wide revolving indoor dry slope for dedicated 1-2-1 coaching. This 45 minute session is ideal for beginners or people wishing to perfect their skills. With no lifts and no queues, the coach remains at your side throughout, tailoring the session to meet your needs. Video analysis is provided. It also provides a great 45 minute work out!